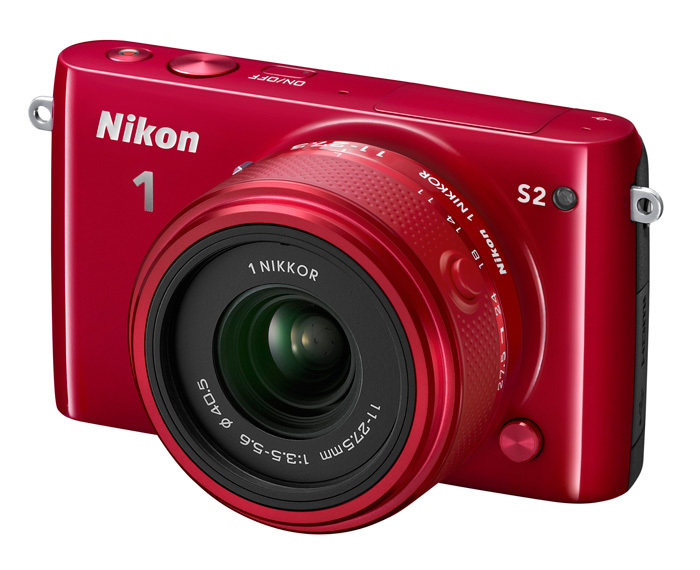 Nikon 1 S2 Preview: Time to step up from your compact or camera phone? Available in a range of funky colours at an attractive €459, including a 11-27.5mm kit lens, the new Nikon 1 S2 is aimed at snappers taking a step up from a camera phone or compact. Back in early 2013 Nikon expanded its range of Nikon 1 hybrid cameras with a new S product line, which offered a more compact design than the Nikon 1 J or Nikon 1 V models. So gone were the Electronic Viewfinders and hotshoes, to give enthusiasts upgrading from a compact camera or camera phone exactly what they wanted – better image quality in a super small shell. The new Nikon 1 S2 builds upon that concept with the addition of a couple of mass market friendly additions, as well as a general upgrade to the specs’. Resolution on the new Nikon 1 S2 has been bolstered up to 14.2Mp, on the same 1”-type CX format sensor used in Nikon 1 hybrids. Some features from the recently released flagship Nikon 1 V3 have also filtered down to the new S2. These include continuous burst shooting of 20fps with continuous autofocus, or 60fps with focus locked to the first frame, as well as the inclusion of Nikon’s EXPEED 4A dual engine image processor, to crunch through all that data. The Nikon 1 S2 utilises a Hybrid Autofocus system, which boasts a total of 135 AF points. 73 of these AF points are the phase-detect variety, similar to those used on DSLRs, with the remaining contrast-detect points ensuring autofocus right up to the edge of the frame. Other features include a 200–12800 ISO sensitivity range, full HD 1080p movie capture, a 3.0in 460k-dot LCD, pop-up flash unit and a new Creative Palette function. Available in Creative Mode, the new Creative Palette features lets you select from a range of photo effect filters to change things like contrast, saturation or white balance, before you take an image. The altered image is then displayed on the LCD screen immediately after capture. The new Nikon 1 S2 is available from June 2014 retailing at €459 including the 11-27.5mm kit lens, or €629 including both the 11-27.5mm and 30-110mm lenses.